I think that it’s safe to say that we pretty much depend upon on idevices. Our phones and tablets keep us organized and in touch with the world around us. And yes, these devices are an investment. Speaking only of my iPhone, I can’t live without it. So, I take care to protect it. I’ve had screen protectors before, I like to keep my phone as nice as possible and I’m a nut about keeping the screen clean. They problem with screen protectors is that they’re often flimsy plastic that always bubbles, turns at the corners and forget about keeping the protector clean. intelliGLASS ($9.95) sent me a screen protector to try on my iPhone. Having just switched cases, I didn’t even have a protector on my phone. I actually wasn’t expecting too much from a rather inexpensive screen protector. To begin with, the packaging was sleek and efficient in a book style with the protector on one side and accessories on the other. The protector itself is a lot more substantial than your typical plastic protector and took seconds to place on my iPhone. Wipe down the screen with the (included) alcohol wipe, use the special sticky dust remover, and install the protector. I can tell there’s some depth to the protector when you go to use the home button. It’s not a problem though. If anything, the protector and its depth, add another aspect to the phone. My screen certainly is smudge and streak free. It’s easy to clean. Specs: intelliGLASS is a new line of screen protectors by intelliARMOR that are crafted with a unique layering process that combines the following; An advanced silicone base layer that adheres to your phone or tablet’s screen easily and without bubbles – all while leaving no residue. An ultra-hardened REAL glass layer that has been specially treated to have greater scratch resistance than steel. (Try to scratch it with a set of car keys and you’ll see what I mean). An oil and smudge resistant outer layer that repels fingerprints and makes cleaning your phone’s surface a snap. The intelliGLASS protector aren’t just for iPhones, they’re available for a multitude of brands and devices! 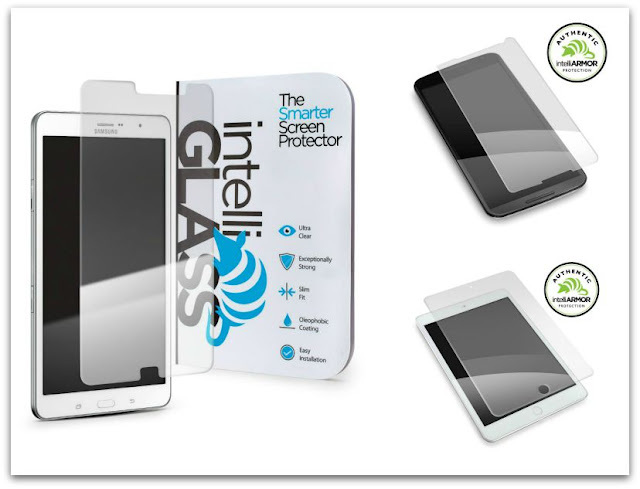 You can grab your own IntelliGLASS Hardened Glass Screen Protector online at intelliARMOR.